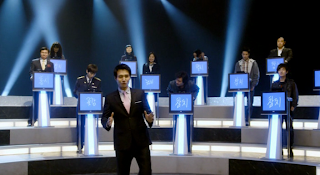 At first, I wasn’t too exited about The Quiz Show Scandal despite the fact that it is a recent effort from one of my favorite Korean filmmakers. There has been very little buzz surrounding it, which is strange for a Jang Jin film. I cannot express my delight as the film unspooled and grabbed me from the opening minutes. It is a wonderful ensemble piece stuffed with sparkling dialogue and surely one of the funniest Korean films of the last few years. It is often the case that while Korean thrillers, horrors, and certain romance films make the leap into foreign territories, comedies have a little more trouble accomplishing this. There are certainly some films with elements of humor that have crossed over, such as Save the Green Planet (2003) and The Host (2006) but few outright comedies have managed this feat. The obvious reason for this is a language barrier or a cultural gap. You can’t really laugh at a joke on a subject of which you know nothing about. Korean comedies often suffer from this, at least from a foreigner’s perspective. Those comedies that can be understood by westerners are often simplistic and not always the most shining examples of the genre, the Marrying the Mafia and My Wife Is a Gangster series come to mind. The more sophisticated the comedy the more likely it is to go over our heads. Jang Jin’s films have definitely suffered from this from time to time due to the fact that he has such a keen wit and is so articulate. He has both those things in spades, but in Korean, which means that some elements may fall by the wayside. But every so often there is a film that breaks through that is both intelligent and jaw-droppingly hilarious. Lee Hae-joon did it with Castaway on the Moon (2009), Jang Jin did it with his script for Going By the Book (2007) and he’s now done it again with The Quiz Show Scandal. Like in his previous films, his ever-inventive scripts are brought to life by the excellent ensemble casts he surrounds himself with. Ryoo Seung-yong, Kim Soo-ro, Song Yeong-chang, Kim Byeong-ok, Lee Moon-so, and Im Won-hee are only some of standouts in the stellar cast, which is supplemented by uproarious cameos from Shin Ha-gyun and Jeong Jae-yeong as well as Jang himself. While it may not have the political rhetoric of Good Morning President (2009), the North-South rapprochement themes of Welcome to Dongmakgol (2005), the criticism of the media of Murder, Take One (2005) or the indictment of authority of Going By the Book, The Quiz Show Scandal uses a clever premise and razor-sharp dialogue as it light-heartedly explores what it means to be intelligent. After a few opening scenes which loosely give us an idea of the characters that populate the mosaic script, they are all thrown together into a police station for the better part of 30 minutes of screen time. A woman has been run over and they are all somehow involved but they don’t know eachother yet. Most of this extended sequence does absolutely nothing to advance the narrative but it brilliantly shows us who these characters are. Suddenly we are given a piece of information, the woman’s USB stick features the answer to the 30th and final question of a very difficult TV quiz show, no one has answered it before and the rolling jackpot is enormous. All our variegated protagonists need to do is get to that 30th question. What follows isn’t surprising but due to its dialogue and characters, it feels like a much more substantial film than it ought to. The comedy is truly top notch and I think that anyone could appreciate it. Some gems include the banner to a depression group that reads “We’re not depressed, we’re just less exited than everyone else”, and the pedantic argument that stems from which model of toy car the characters are being represented with as the police try to reconstruct the scene of the accident at the precinct. Another great bit in the opening scenes, which could only come from the mind of Jang Jin is when a pair of gangsters, who are torturing and preparing to kill someone, argue about the provenance of a quote, which the first identifies as Pavarotti while the latter corrects him by pointing out that it was from Goethe’s Faust. Without spoiling anything else I would urge you to immediately seek out this wonderful film, it is definitely one of Jang’s best.